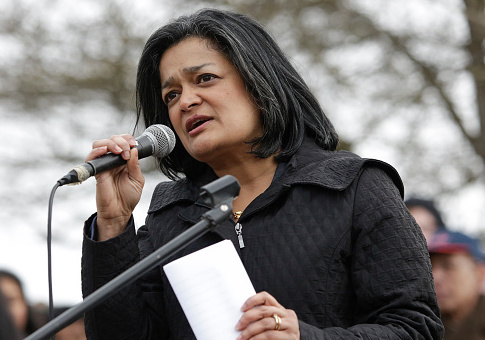 Democratic Rep. Pramila Jayapal (Wash.) joined the migrant caravan on Saturday in their attempt to cross the border, condemning President Donald Trump for "creating the crisis." She said she was able to help five asylum seekers gain access to the United States. "When I read the report about a week ago that kids and moms were being tear gassed, I just couldn’t sleep," she said. "I want to go see for myself what is happening, what happens to asylum seekers as they get to the border, how are they turned back, what’s happening to them in between, where the conditions in which they’re living. The Department of Homeland Security released statistics that showed the use of pepper spray was used by previous administrations. In fact, the Obama administration used pepper spray at a higher rate than the Trump administration. This entry was posted in Politics and tagged Immigration, Migrant Caravan. Bookmark the permalink.